Valentine’s Day – What’s Your Soundtrack? So the glorious day that is Valentine’s Day was yesterday and all you couples out there were probably having a very special day together. Maybe spoiling each other senseless on a shopping spree, maybe catching a film or if you were really lucky, you headed out to a snazzy restaurant and your other half treated you to a bottle of Champagne. But I wonder how many of you received one of those awful soppy compilation CDs you see advertised so frequently around this time of year? In an attempt to make more money (as if Valentine’s Day isn’t already a complete money farce), record companies and artists choose to release rubbish love albums which I’m guessing are supposed to make your other half feel like the only person in the world. If you love them, you should show them every day not just one day a year and then through an appalling selection of songs. I mean, don’t get me wrong, everyone likes a good love song but it’s annoying when every TV advert is another addition of the same songs by different artists. I can’t help but think that maybe these CDs are produced to make single people even more depressed and lonely on Valentine’s Day. I bet you there are singletons out that who buy themselves one and sit home alone and drink wine singing along to the songs (a bit like Bridget Jones). I don’t know what’s worse, being bought one by your partner or buying one for yourself? Either way, those CDs are my pet hate near Valentine’s. Don’t buy them, your partner will only hate you. Last year I had the pleasure of seeing Naturally 7 perform live. They were only a supporting act but they were the best supporting band I’ve ever seen. So the reason for this blog is to make people aware of them. 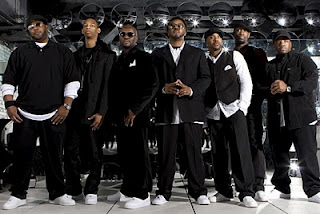 I’m guessing the majority of you haven’t heard of them so, for anyone who doesn’t know who they are, Naturally 7 are a vocal play group. They produce their own songs as well as doing covers of old classics, such as Michael Jackson’s Billie Jean. After browsing youtube for videos of them, I found a great clip of them performing on a Paris subway where they burst into a cover of Phil Collin’s Feel It (In The Air Tonight). It’s a fantastic clip of them. They’re giving it their all on this train. First of all, the other people on the tube don’t seem very interested but eventually they take to them, just like I think most of you will. There’s no denying that they’re a great band. Their harmonies are always spot on and they’re interesting to listen to and watch. It’s mesmerising. Armand Hutton (AKA Hops) is my favourite, he does the bass. For such a skinny guy his voice is extraordinary. When he opens his mouth this extremely deep bass noise comes out. I was driving to Stroud yesterday with Radio 1 on. Sometimes Radio 1 is great, other times the worst music in the world floats through the airwaves. For example, last night they played Britney’s newest single, Hold It Against Me, which is just atrocious. It sounds like an old 1990s single mingled with Disney’s painful young star, Hannah Montana. The chorus is the worst part in the song. It really is like she’s taken it from a Steps song (I’m going to guess that you’re getting a good idea of just how bad it is now). She’s also sadly and destructively taken a few hints from Cascada, as a friend rightly suggested, meaning the backing music is just as horrific. It’s a shame. Britney was loved by everyone at one point but if she produces songs like this, no-one will ever love her again. For every artist, there’s a time when they should just stop. They should pack in what they’re doing and either retire or do something different. I feel Britney’s past it now and she’ll never be as popular as she once was. Please stop now, Britney.